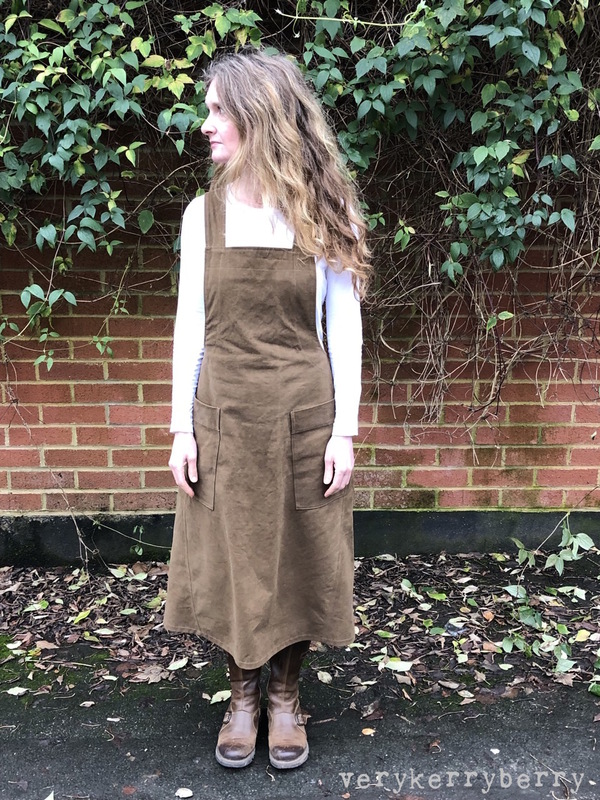 I've been wearing this Assembly Line Apron Dress since late December so it is about time I shared it here. It's a great pattern - all the Assembly Line patterns that I've sewn (V-neck dress, Two Cuff Tops) have resulted in frequently worn garments that definitely bring me joy. 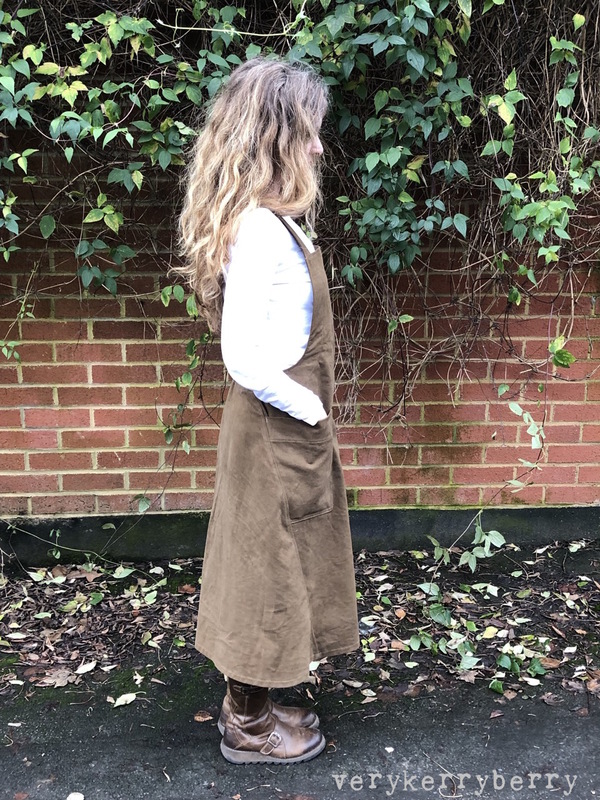 I have a similar ready-to-wear dress to this, a charcoal cotton drill apron dress from Toast which has a similar pleat feature at the back waist. I've worn it a lot so this pattern was love at first sight. I bought it last year when Assembly Line patterns were just arriving in the UK (Draper's Daughter) and were sold in single sizes. They are now available multi-size. I bought an S but the fit was quite generous and I needed to reduce the size a little. 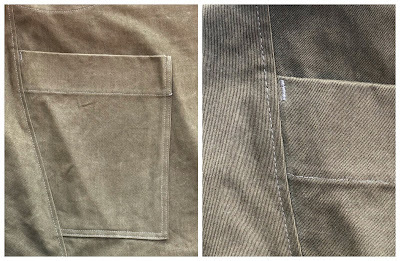 I used a cotton twill fabric from Clothspot (similar o the website). 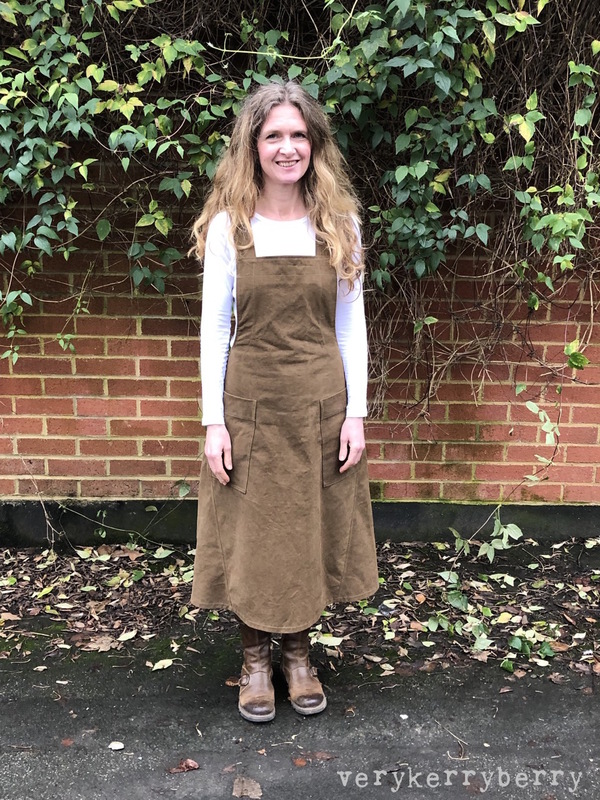 It's got a bit of weight to it and soft fuzzy feel, it's got a lightly brushed texture so I had to cut so the fabric pieces all lay in the same direction- on the layout suggestions, pieces run both ways. I'd also had the fabric sitting around for 6 months and although it was not in direct sun, the centre fold line created a big faded vertical line down the centre which I had to cut around. 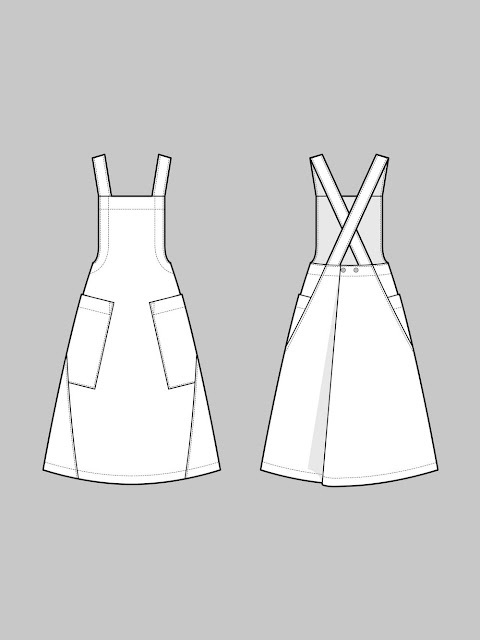 You can see the main features on the pattern technical drawing. Lengthened the skirt section front and back by 2". The pattern includes lengthening and shortening directions. 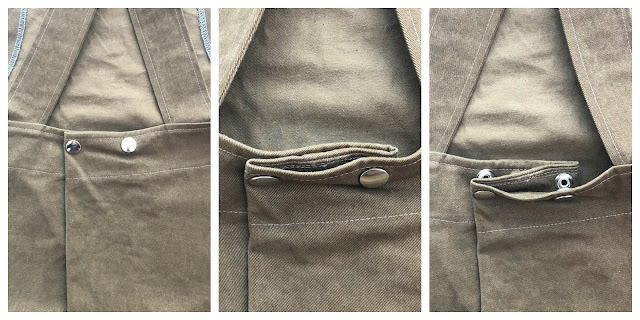 Seam allowances are 1cm (3/8"), to reduce the waist I sewed 1.5cm (5/8" on all side seams, a total reduction of 3.8 cm (1 1/2"). The fit is comfortable. When the back waist snaps are undone, you need to be able to take the dress on and off over the shoulders so it can't be too fitted at the waist. I didn't use interfacing on the side and top facings as the twill was quite thick. In hindsight, I should've used it along the top of the bodice as it has lost a little shape there. Strap length reduced by 1/2"
Hem reduced to 3/4" as I wanted to maximise the length. When I make another, I will cut it slightly longer to allow for the deeper hem to match the topstitching features. 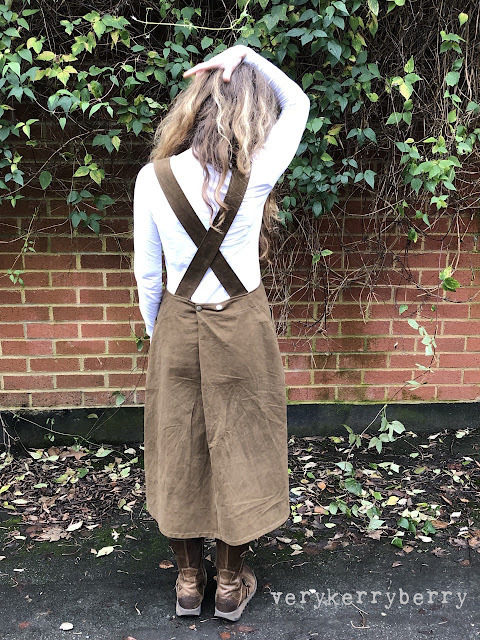 I love the back pleat where the waiting fastens. It creates an A-line skirt so plenty of room for walking, but without excessive fabric around the waist. I used Prym anorak snaps from an ancient set in my stash and they are secure and don't feel bulky. I find dresses like this perfect for everyday wear, it's truly an ideal uniform for my lifestyle! I like the utilitarian, but feminine aesthetic. I'm currently cutting out a second from a lightweight blue twill that I bought years ago to become a coat. 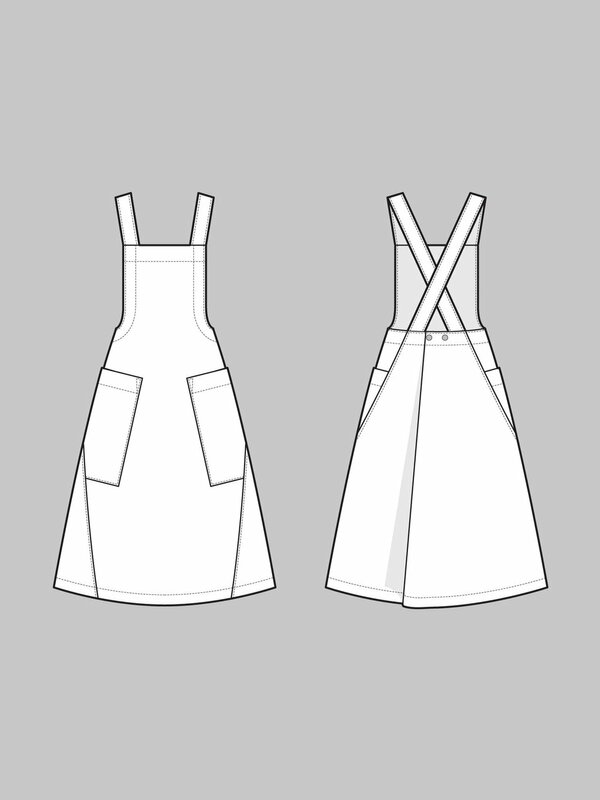 This time I'm going to add a cotton lawn lining as my Toast apron dress has that and I like the extra layer. I'll try to share that one a bit quicker! In the meantime, you can find the pattern at The Draper's Daughter or go straight to the Assembly Line website. This looks beautiful! Love the design and the colour you chose.